DUMBARTON suffered a 2-0 home defeat in a very close contest against Dunfermline Athletic, then found themselves in ninth place in the Ladbrokes Championship table. 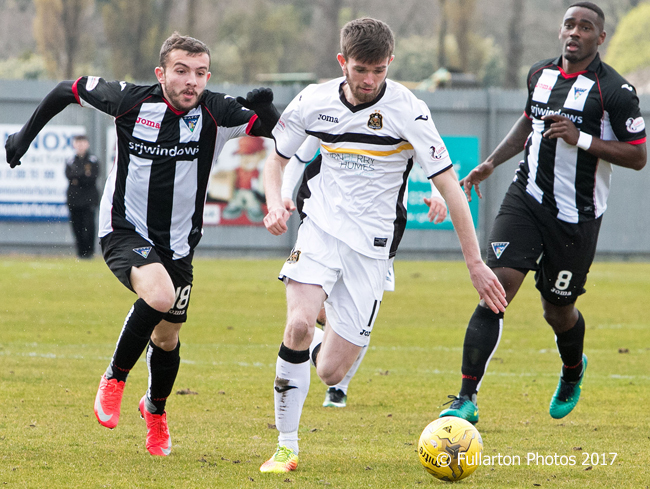 DUMBARTON suffered a 2-0 home defeat in a very close contest against Dunfermline Athletic in front of an 1,142 crowd, then found themselves down to ninth place in the Ladbrokes Championship table. A win for Raith Rovers at home to Morton and draws for St Mirren and Ayr United mean that Sons are three points clear of bottom side Ayr, are below St Mirren on goal difference, and trail Raith by a point. In a game made difficult for both teams by the wind, both teams were fast out of the starting blocks, with Sons having more of the early chances and Dunfermline establishing midfield dominance as the half progressed. The key moment of the half for Dumbarton came on 33 minutes, when Darren Barr nodded the ball down into Gregor Buchanan's path, but he hit it straight at the keeper from close range. Robert Thomson's follow-up then hit the post. After the break Sons had another chance to take the lead. Andy Stirling got on the end of a low cross from David Smith but directed it agonisingly wide. On 79 minutes Dumbarton failed to clear their lines and Rhys McCabe punished them with a low, long drive into the bottom corner for the opener. The Sonstrust Man of the Match was keeper Alan Martin, who put in another impressive display, in spite of the goals. The picture shows Sam Stanton racing away from Paul McMullan and Nat Wedderburn.